As you probably already know, most of travel software providers charge their clients with different booking fees, either as a percentage of the booking value, either as fixed amount per booking or even as a fixed amount per passenger. In case of large volumes, this fact translates into important costs for the travel agency. dcs plus is different - we do not interfere in our clients business strategy by applying booking fees. So, your cost for booking through our systems is 0. Please take a look at the figures in the table below, to observe the sums you can save by wisely choosing between different software providers. As you can see, we simulated what it means to be charged by three different suppliers with 0.8%, 1.00% and 1.20% of the bookings value, for a possible volume per year of 12,000 bookings, with an average value of 500 EUR per booking. 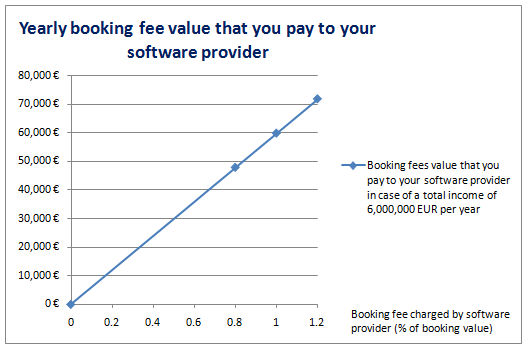 After a simple calculus, you can notice that you have to pay to your software provider a booking fee of at least 48,000 Eur per year, but you can also reach an amount of 72,000 Eur - which is quite significant. If you want to see what exactly means to you in terms of cost reductions, please use the simulator below. Introduce your possible booking volume per year, an average value per booking, and you will be able to observe the amount of booking fees that you have to pay to your software provider, according to the different percentages they charge. There are significant amounts… Well, dcs plus charges you 0 EUR per booking. Think about it! If you have questions about dcs plus products, let us know!